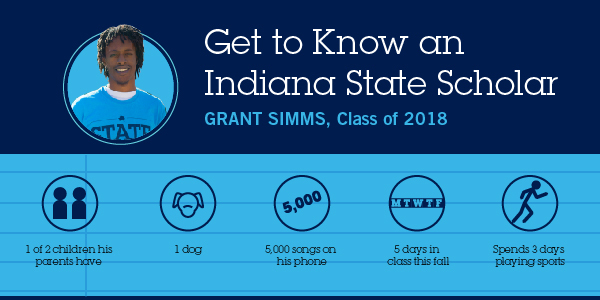 Grant Simms, a junior from Indianapolis, is a recipient of the Center for Leadership Development Scholarship, awarded to students participating in the Center for Leadership Program in Indianapolis. 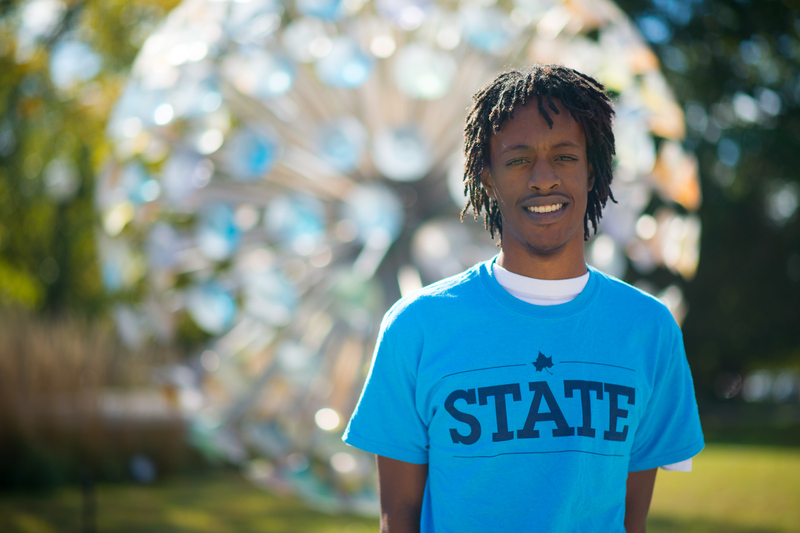 Simms, majoring in communication with a concentration in electronic media, has had two professors who have changed his life -- Richard Green and Brian Johnston. The personal connections Simms made with these two professors landed him a job at Indiana State's radio station WISU-FM. Simms would like to work for a radio company when he graduates. Simms referred to a radio show that is similar to The Breakfast Club, which is a hip hop radio station that interviews famous artists. If you could eat lunch with a famous person, who would it be? "Kanye West because he is really creative, and I feel like he would open a lot of doors for me." If you were asked to give another student advice, what would it be? "To always stay focused. No matter what the goal is, it is important to stay focused and understand the outcomes." "I know it sounds cliché, but my family. I am my little brother's role model. Being his role model keeps me on track." "I would want to be in Los Angeles because of the weather, shopping and the scenery. I would wake up and have breakfast. I would get paid from work, so I can go shopping with my friends and have no worries. After shopping, I would be on the beach and end my day relaxing at my house in L.A."
"I have two, ‘By any means necessary' and ‘I will not capitulate.'"